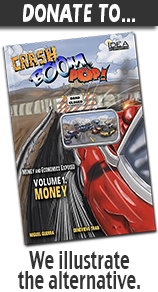 We're happy to announce that our StartJoin project for "CRASH, BOOM, POP! : Money and Economics Exposed" has passed our goal and is still going strong. We're now accepting Bitcoin payments as well. Thank you to all of our backers! We appreciate each and every one. Please click on the image for more info, or click here.